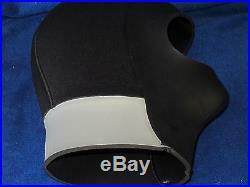 Bare Elastek 9mm neoprene Drysuit Style Scuba Diving Hood. A great performance hood for comfort and warmth. 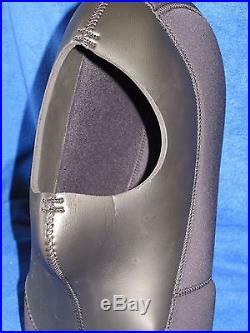 An extremely comfortable coldwater drysuit hood made from 9mm full-stretch Elastek neoprene. 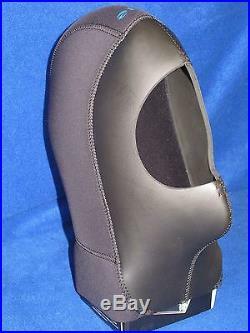 Designed to work well with a Full-Face Mask - glideskin around the exterior of the face and neck area. Bare Elastek Dry Hood Features. 9mm neoprene with Bare Elastek Full-stretch neoprene for ultimate stretch and comfort. 5mm Elastek Glideskin face and neck helps minimize water movement in or out of your hood. 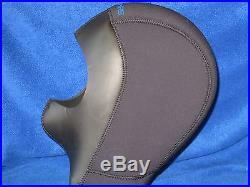 Neck seal glides easily over your hair. Vented to allow trapped air to escape. 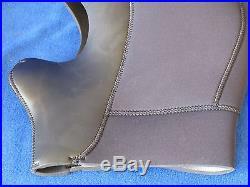 Hood neck seal mates with your drysuit seal collar. Great way to keep your head warm. Useful for many water sports. Great for swimming when the air temperatures are colder. Bare Elastek Dry Hood Technical Specifications + Sizing. 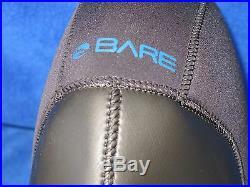 Made from Bare's 7mm Elastek full-stretch neoprene for ultimate stretch and comfort. Sizes: XS, S, M, L, XL, 2XL. Size chart shown in the pictures for this listing. For the Forehead measurement, measure around your head just above your eyebrows. Your hood should be snug, but not too tight. 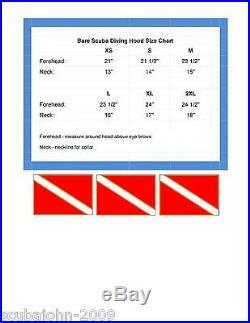 If your hood is too loose, you will have a lot of water circulating in and out of your hood and around your head which will lead to your getting cold earlier in the dive. If you hood is too tight in your neck, you could pass out. If your hood is too tight around your head, you will likely get a head ache. The item "Bare Elastek 9mm neosprene Drysuit style Scuba Diving Hood" is in sale since Wednesday, December 23, 2015. 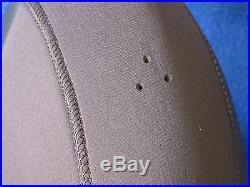 This item is in the category "Sporting Goods\Water Sports\Wetsuits & Drysuits\Hoods". The seller is "scubajohn-2009" and is located in San Jose, California. This item can be shipped to United States, Canada, United Kingdom, Denmark, Romania, Slovakia, Bulgaria, Czech republic, Finland, Hungary, Latvia, Lithuania, Malta, Estonia, Australia, Greece, Portugal, Cyprus, Slovenia, Japan, China, Sweden, South Korea, Indonesia, Taiwan, South africa, Thailand, Belgium, France, Hong Kong, Ireland, Netherlands, Poland, Spain, Italy, Germany, Austria, Israel, Mexico, New Zealand, Philippines, Singapore, Switzerland, Norway, Saudi arabia, Ukraine, United arab emirates, Qatar, Kuwait, Bahrain, Croatia, Malaysia, Brazil, Chile, Colombia, Costa rica, Dominican republic, Panama, Trinidad and tobago, Guatemala, El salvador, Honduras, Jamaica, Bahamas, Viet nam, Uruguay, Cayman islands, Peru.